HOW HAS TECHNOLOGY IMPACTED YOU AS A JEWELRY DESIGNER? The impact of technology on work and jobs was the focus of a recent opinion piece in the New York Times by David H. Autor and David Dorn. And, as jewelry designers, we are living through and with all the positives and negatives that arise through this technological change. How has technology affected what we do as designers? How has it affected what we do to survive and thrive as designers? Have we mechanized and computerized the jewelry design business into obsolescence? How have you had to organize your jewelry designer lives differently? What has happened to your local bead stores? What has happened to bead magazines? If you teach classes for pay, or sell kits and instructions, how do you compete against the literally millions of online tutorials, classes, instructions and kits offered for free? 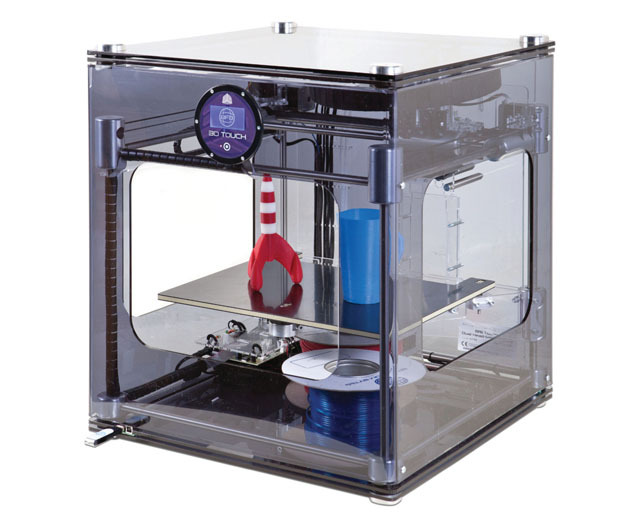 How does this affect what you teach or design to sell as kits? If you sell jewelry, how do you compete against the 60,000,000 other people who sell jewelry online? How does this affect your marketing, your pricing, your designs? If you make part of your living doing a arts and crafts show circuit, will there still be a need for this in the future? 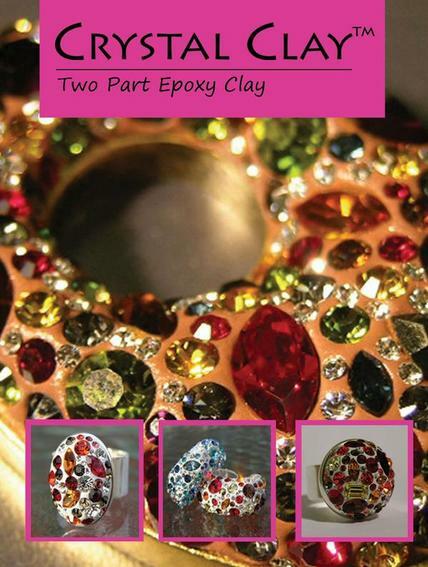 Let me paraphrase these a bit in terms more specific to jewelry design and beadwork. Does the reach of technology, through such vehicles as the Internet, make things so productive and efficient, that we no longer need so many people making jewelry, or teaching jewelry making, or marketing businesses / products or selling the parts to make jewelry? If we do not need so many people to design / teach / market / or sell, and there happen to be a lot of people doing this anyway, does this necessarily make the relative worth and price for any of these activities “$zero”? Does all this technological efficiency diminish the act of “creativity”? Now so many things can be standardized that everything – even the manufacture of complex pieces of jewelry through 3-D technology – can be reduced to a set of how-to instructions – mere recipes? Has this technology reduced the need for bead magazines, and bead stores, and traditional classes? On the other hand, technology has made jewelry design, and good jewelry design, more and more accessible to more and more people. It has opened up a myriad of possibilities for people to explore their creative selves. It has let jewelry designers reach a broader audience with their wares, their knowledge and their endeavors. 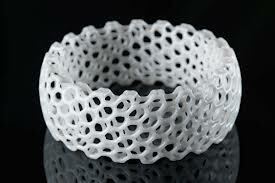 With new materials and technologies have come many new possibilities for creating jewelry. It has made it easier for more people to get into the various jewelry design-related businesses. It has made it easier to stay current and learn. 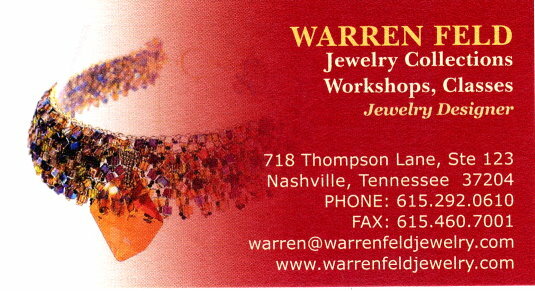 It has made it easier to meet and learn with fellow jewelry designers. It has made it easier to mine big data, identify the most relevant target customers, and to market to them in very specific, cost-effective ways. It has made it easier for retail outlets to find the merchandise they need to sell. – We have an elaborate curriculum of classes that we teach. However, many of the beginning classes are becoming obsolete, in the sense that students can find similar classes on YouTube, in bead magazines, and throughout the internet, now for free. The issue for us is how to adapt, given that one of our goals is still to charge money for these classes, and make money. And a concurrent goal is to offer the student a learning opportunity worth the price paid. – Each year, we used to have 1 or 2 national level instructors do workshops at our store. But it has become difficult to attract students. There are so many projects easily available – including from these national-level instructors – that students started to indicate that their interests in these workshops had diminished. They could do these same or similar projects on their own. – When we opened our store in 1991, there were few places for people to acquire what we sell. Now there are almost 100 million places for people to go. It is obvious that most of our in-store customers purchase more of their supplies online or through catalogs than they do in the store. – We used to do craft shows a long time ago. But the cost of travel got very expensive, and, with the internet, people had more opportunity to find what we sold without going to the craft shows. – It used to be that the crux of our advertising dollars were spent with bead magazines. No longer. Bead magazines get a very small part of our advertising dollars. I can remember when all our customers read the bead magazines to get all their information. Now very few do. Most have organized themselves into small groups in various social media sites. To get your marketing message across, you have to spend a lot of time doing this online, and you can no longer market with a “broad brush”. That is, it has become ever-more-difficult to reach people. – Our online business – Land of Odds – has been in existence since 1995. It has gone through 6 technology upgrades/re-designs since then. 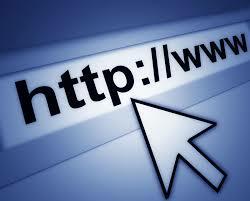 The e-commerce and website design technology moves and evolves so incredibly fast. Personally this constant updating has been grueling. The site needs more re-design, but my motivation to learn and cope with yet another computer language and new sets of tasks has diminished. Land of Odds was a pioneering online business. But the very large bead companies have gotten their acts together online, and are much better capitalized to expand their operations. Technology has been a dauntingly mixed bag for us. On the negative side, the rapid advance and spread of technology has overwhelmed the various activities we do. On the positive side, it has forced us to become ever more creative and ever more efficient in what we do. It forces us to constantly re-define who we are and what we want to do. And it forces us to constantly re-define how we do things. If you are a jewelry designer who has ambitions to have your work publicized in books or magazines, or to be accepted into a juried show or exhibit, or to sell your things in a store or gallery, you need to be able to promote your work. Often, I have found, creative-types can be shy when it comes to self-promotion and marketing. What insights, from your own experiences, can you offer your fellow jewelry designers about self-promotion? What kinds of things help you to overcome any fears about marketing your work? How do you handle criticism and other rejection like getting the dreaded “No”? From an article I wrote…. Jewelry designers often find a self-satisfaction in working intensely on a project, often in isolation or solitude. But when it comes to tooting their own horns – this is not as easy or satisfying for them. There is a discomfort here. You might want to show your pieces to others, perhaps submitting them for review or a juried competition, or perhaps wanting a store or gallery to accept your pieces for sale. Then humility kicks in. Or perhaps a lack of confidence in yourself. Or a fear of criticism. Or a rejection. Hearing: No, we don’t want your pieces. We don’t want to appear desperate for a sale, or too eager for acceptance. But, if you don’t believe in yourself and your products, no one will. Your fantasy of striking out on your own will never materialize, if you don’t find it within yourself to do some self-promotion. And the first step is understanding and recognizing that to promote yourself means promoting your value. Your jewelry has VALUE to them, why….? If something has value to someone, then they typically want to know about it. Your jewelry has value to them because it solves a problem for them. It might make them happier, more beautiful, more enriched, more satisfied, more powerful, more socially accepted, more understanding of construction or technique or art and aesthetics. It might be better than other jewelry they see or wear or think about buying. For a store or gallery, your jewelry might be more saleable, more attractive as displayed, better constructed, more artistic, more stylish or fashionable, a better fit with their customer base, with good price points. You promote the value of your jewelry to your audience. You do not have to brag. You do not have to be shameless. You do not have to do or say anything embarrassing. Just speak the truth about value. Share examples of your work and what you have done, not your ego. And that brings up the second point – speaking. People who are more comfortable speaking about themselves and their products tend to be more successful in their careers. Products don’t sell themselves. People need to be nudged. This “speaking-about-themselves and their products” is a basic communication process. This communication process is a process of sharing information. You want to educate the right people, in the right way at the right time. You want to speak about who you are, and what you make. The values your jewelry has to offer them. And how you would like to develop your relationship – whether designer/client or designer/retailer or designer/jury – so that you may both benefit. Fundamentally self-promotion is about communication. Communicators frame the narrative. Communicators start the conversation. They begin on favorable terms. They would not say: Would you like to see my jewelry? Instead, they would say: I have jewelry you are going to love. And this brings up the third point – be relevant. Know your audience, what their needs are, what their problems are that need solving. You may have created the original piece to satisfying some personal yearning and desire. But if you want someone to buy the piece, wear the piece or sell the piece, you need to anticipate why. Why would they want to buy, wear, review or sell your piece of jewelry? Do not assume they will figure all this out on their own. You will need to help them along in this process. 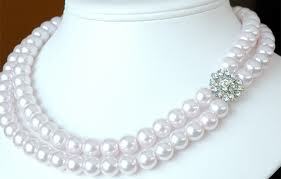 You will need to communicate about the value your jewelry will have for them. You will need to do some self-promotion. The last point – inspire people to spread your message. Your best marketing and promotion will be what is called “word-of-mouth”. So you want to create supporters and fans and collaborators and colleagues. And you want them to be inspired enough about you, your creativity and your jewelry, so that they tell others about you. You inspire your current network of family and friends. You might make a presentation or teach a class. You might share images of your work on social media like FaceBook or Instagram or Twitter or Pinterest. You want to regularly connect with people, so that you and your work are frequently in their thoughts. There are many self-promotion strategies that you can do. You don’t need to do everything at once. You might try one or two ideas first, and do those, then pick a third, and so on. Wear your jewelry all the time, and don’t be shy about saying you made it! Follow up with customers and contacts, such as after a purchase, or after someone accepting to include you piece in a magazine, or sell their pieces in a shop. Thank them. Reinforce your personal brand with a short comment about the value of your pieces for them. Have a clear personal style that you can point to in your jewelry, and that you can speak about. Have a clear idea of what is called your “competitive advantage”. What are those 5-10 things about you and your work that sets you apart from, and perhaps makes you better than, the competition. Search for companies or people that may want to see or buy your work. Use directories on Yahoo and Google. Use LinkedIn.com. Search Twitter looking for people who are saying they need custom jewelry work done. Network with other jewelry designers, both in your local area, as well as online. Ask for feedback on the self-promotional activities you are doing. Have any of these worked well for them? Are they doing other things you haven’t thought of? Get out of your studio and meet people in the flesh. Attend trade shows, networking events and charity events, or other types of places where your clients might also attend. Offer something – one time only — for free. A free class, a free repair, a free pair of earrings. ODDS or EVENS…What’s your Preference? Sometimes, jewelry must conform to a type of numerology – odds or evens or multiples of some number, like the number 3 – related to the numbers of beads or the numbers of strands or the numbers of drops. — The number of strands in a necklace or bracelet? — Or the number of bangle bracelets you wear on one arm? — Or the number of beads you use to begin a peyote stitch project? 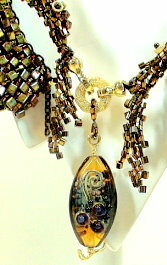 — Or the number of drops you include in your piece, or dangles you include in an earring? — Or the number of colors or elements repeated in a pattern or jewelry segment? Is this ODDS/EVENS preference consistent all the time? Or is it situational? That is, in certain circumstances you prefer ODDS, and in others, EVENS. Is there any experiential, aesthetic or hypothetical basis for your preferences? If you have a preference for one over the other, has does that affect your design process? Do you get more compliments, when you are wearing one- or three-strand necklaces, than when you are wearing a two-strand necklace? 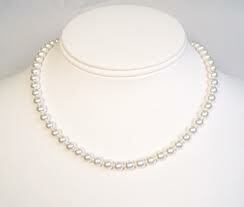 Historically in Europe, it was considered bad luck and inappropriate to have an EVEN number of strands in a necklace. If you had a very long necklace that you would occasionally wrap around your neck multiple times, then it had to be long enough so that you could wrap it around an ODD number of times – such as tripled, never doubled. Even today, in etiquette books, such as “Miss Manners”, the rule is “Always Wear Odd Numbers of Strands of Pearls.” No explanation is given. Russians even believe that you should never give an even number of flowers to your wife or girlfriend! In ancient Babylon, even numbers were believed to be unlucky and somewhat demonic. To them, something should never be repeated an even number of times. An ODD number of beads lets you define a specific center and focus. Cognitively we prefer things with clear pointers and with clear symmetry. But we also like balance and harmony and things to be distributed EVENLY. Where do you come down in this ODDS vs. EVENS debate? 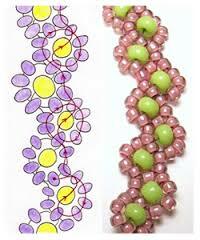 I do a day-long workshop called Beading Calisthenics. There are 10 of these exercises. This is the 10th one. Beading requires a lot of mind-body coordination. That takes work. It is work. You have to be able to get from your fingers to the needle to the beads, back along the thread to the needle to the fingers, hands, arms, eyes, mind. And then again. And again. Over and over, one more time. You need to get into a rhythm. All these working parts need to be working. No time for cramping. No time to get tired. No time to lose concentration. A rhythm. Needle, pick up bead, pull down along thread, check the tension, pick up a bead, pull down along thread, check the tension, pick up a bead…. I noticed that different instructors had various techniques and strategies for maintaining this rhythm. Yes, music was involved sometimes. Othertimes simple meditation or creative reading and discourse. Some people had some stretching exercises that they did. Others tested themselves before proceeding with their big project. Still others did small things to reconfirm their learning. I distilled what I saw others do effectively into 10 fun yet challenging beading calisthenics. The challenge here is to see how many variations you can construct using the simple daisy chain stitch. This is a very simple stitch. Try it out. Experiment. And share your results with the group. Simplest daisy chain: A stem and a flower with a center bead, then a stem and flower w/center, and so forth. Start with a line of 5 beads. Add 5 more beads to your thread. Make the 5th bead a different color. This is your “flower set”. The 5th bead is your center point. Make a loop by going back through the first of these 5 beads in the set. 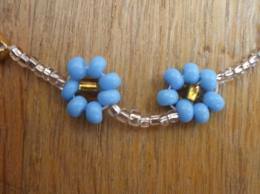 Add two more beads to the flower set, and bring the needle through 4th bead in that original set of 5. So the daisy pattern goes: BEAD 1 to 2 to 3 to 4 to 5 (flower center point bead marked by X) back to 1 to 6 to 7 back to 4 and out. Add another line of 5 beads. Continue. Try the daisy chain above without the stem, so that each flower set is interconnected by one bead — # 4 (which becomes #1 in the next flower). Make your 5th bead a different color. 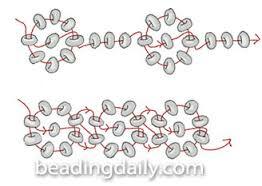 Next, look at the modified daisy chain pattern below. Try another interconnected daisy pattern, where we would connect each subsequent flower by two beads, instead of one. Here we would make the first daisy’s 3 and 4 become the next daisy’s 1 and 6. This would go: 1 to 2 to 3 to 4 to 5 (flower center) to 1 to 6 to 7 to 4 up through 3 and out. Then 3 becomes 1 in the next daisy link. The pattern continues in the second link as 1 to 2 to 3 to 4 to 5 (flower center) to 1 to 6 to 7 to 4 up through 3 and out. Then 3 becomes 1 again. Try the same pattern, this time making the 2nd, 5th and 7th bead the same color, but different than the others. Try again, making the 1st, 5th and 4th beads the same color, but different than the others. Try again with any of the patterns, this time using a different size/shape/style of bead for the 5th one. In Horace Goodhue’s Native American Beadwork book, he details many, many variations, including several that do not result in “flowers”, but rather patterns of lines. The daisy chain is indicative of a “traditional” design. What kinds of things can you do to make the daisy chain have a more “contemporary” feel? Such as newer metallic colors? Or somehow increasing the dimensionality of each flower so it doesn’t feel so flat? 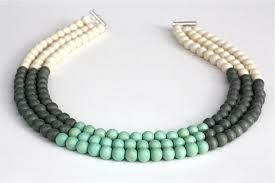 Or creating a color pattern with beads 1 thru 7, so that the pattern is very op-art or contemporary graphic in feel?